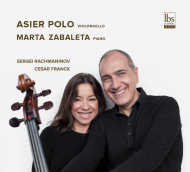 Together with the magnificent pianist and regular recital partner Marta Zabaleta, Asier Polo has released a new album, which is a beautiful selection of romantic repertoire for cello and piano. Together, Asier and Marta perform four works that display technical and emotional virtuosity. The two most substantial works on the disc are Sergei Rachmaninov’s Sonata Op. 19 in G minor and César Franck’s Sonata in A minor, and these are paired with Alexander Glazunov’s Chant du Menestrel and Maurice Ravel’s Vocalise-Etude. They are four outstanding works of great interest that demonstrate the richness of colours, ideas and sound worlds that opened the 20th century. The CD, released on the Ibs Classical label, was recorded last October in the Auditorio Manuel de Falla, one of the most emblematic musical venues in Granada. The sleeve notes are by Blanca Calvo and include a detailed explanation of the pieces and of the artists’ interpretation, and this is illustrated with photographs by Pablo Axpe. With an extensive discography of 14 CDs, Asier Polo returns with this new production, which is his second with Marta Zabaleta, and which promises to be a “journey to the bottom of the soul”. The CD is already on sale through the Ibs Classical website. 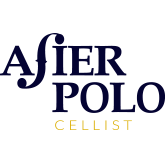 You can download a press kit, which features interviews with Asier Polo and favorable reviews of the disc in Spanish here.